Luxury World Traveler (LUXWT) is the largest luxury travel-themed Instagram account in the world. Our follower base is made up of affluent adults ages 25-65 who book luxury travel. The first step in our program is working with our hotel partners to understand your client demographics. Once we evaluate important factors such as age, gender, marital status and individual interests, we can identify an avatar client profile. 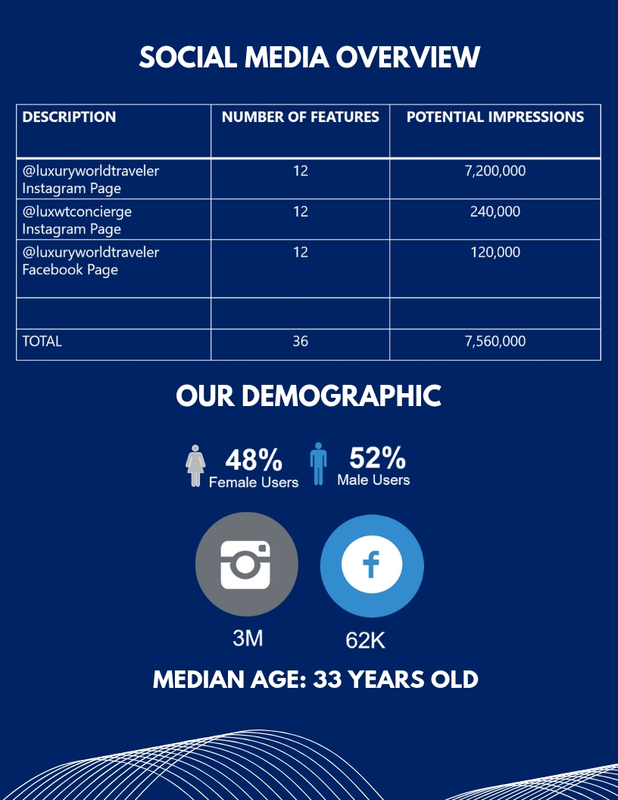 We utilize this data provided to us by our hospitality partners to boost posts on Instagram and Facebook to that targeted customer base. By providing Luxury World Traveler with all the needed data points, we can effectively reach up to millions of other clients who are not following our social media accounts. To maximize both the short-term and long-term ROI for our hospitality partners, we use a call to action to drive clients from the our social media pages to corresponding landing pages. The Luxury World Traveler team creates bit.ly codes to track web traffic and will construct landing pages for each hotel promotion. To receive the booking code, potential customers will need to enter their name and email address. This information will be used for future digital consumer marketing. Our hospitality partners will be required to create a unique promotional package and corresponding promotional codes to the hotels. We suggest the promotion will need to include a free night stay at the property as part of the travel package. In most cases this will require the customers to purchase a minimum of 2-3 nights stay at the property in order to receive the promotional free night stay. Customers will be re-directed to the hotel booking site where they will be able to view the exclusive offer presented to them. The offer will only be available on the hotel partner's website. After the Hotel Clients book, to support Luxury World Traveler in monitoring trackable ROI on participation, hotel partners will provide ongoing (e.g., monthly) reporting to Luxury World Traveler on global bookings placed, by property, under the promotion code. For more information about this program, please click the button below.